Story Telling, Magic Shows, Birthday parties, Church events, AWANA Progams, Assisted Living Facilities, Balloon Artist, Family Entertainer for All Ages. If you're looking for an all in one combo that is within budget, Buttons the Christian Clown is the way to go. 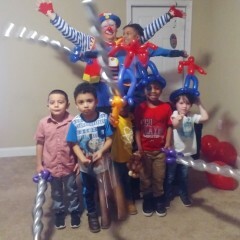 Buttons the Clown gave my children and his friends a magical experience for his birthday celebration. He kept the children laughing and entertained the whole entire time! The magic show was phenomenal and the balloons that were made for the children were on point and was exactly what he wanted. We definitely will be using Buttons for future events. Buttons trained our students how to make balloon creations! We had more students show up then we expected (planned on 6-10 and had about 2 dozen) and Buttons had no problem taking care of everyone teaching them how to create 4 or 5 balloon creations for our upcoming summer block parties! He's the BEST!! Buttons has been a part of the Williamston Spring Water Festival Children's Stage, plus other events in the town for over 10 yrs. He is a great entertainer and the children love him. Dependable and always on time. Thank you Dianne. It is alway a fun time at the Springwater Festival. The Festival is a great family entertainment event. Buttons presented a reading program for our elementary school!! His performance was exemplary. It was entertaining, educational, and so engaging!! I hired Buttons for a birthday party for my six year old son and several of his friends. He was so entertaining and kept the children occupied with a magic show and the best balloon animals I have ever seen. We were so pleased with the show that several other parents asked for his number and planned on including him in their future parties. Thanks again for the great time! Thank You Ms Trish. It was a fun party. Andrew was a great "assistant". I hired Jim (aka/Buttons), sight unseen, for an event at Greenville Medical Clinic. It was a Health Fair....we were sure there would be kids in attendance. I, myself, was out of town during the event, but stayed in touch with Jim during the planning; asking him to adapt his costume and his balloon designs to fit the HEALTH venue. Bottom line....he stole the show, as well as the hearts of everyone who attended...going above and beyond to help the other volunteers, and to make sure everyone laughed and had fun. Jim gives his fee to the Missions; he is a real talent, a fine human being, and indeed, a Christian Clown. Thanks Jim, from everyone at Greenville Medical Clinic! Thank you Miss Nancy. It was a fun time. I really enjoyed it. I was impressed by the mission of the medical clinic. I have hired Buttons the Clown two times. The first time I hired him to entertain a group of homeschool children. The second time I hired him to perform as Gymni The Magic Balloon Guy at my son's 7th Birthday. He did an EXCELLENT JOB both times! He was on time, in character, and entertained the children (and parents) for the whole show. I would highly recommend Buttons the Christian Clown (or his other character Gymni the Magic Balloon Guy) to anyone looking for quality entertainment! Buttons or Gemini bring laughs and fun at every appearance. Jim Barnes developed Buttons the Christian Clown in 1995 to share Christ in a different way. Gemini and his Tuxedo came in 2003 as a non-threatening clown for little kids. Now, as either Buttons or Gemini the Magical Balloon guy, Jim entertains kids of all ages. You might see one of them at a church event presenting "Magic with a Message" or at a birthday party making the birthday child the star of the show. Buttons or Gemini also show up at family reunions, grand openings, and assisted living or nursing homes, where he entertains with balloons, jokes, and magic. You can also see Buttons at the Elberton Georgia 12 County Fair where he has entertained annually since 2008. Most important are the mission trips that Buttons or Gemini participates in, presenting Christ in a special way to kids of all ages in another country or a disadvantage area in the US. Financing those trips is the reason Buttons or Gemini participate in all the other activities. Buttons is an award-winning clown, with awards in Balloon Art and Clown Performance from the South East Clown Association annual conference. Jim moved from Juneau, Alaska to Anderson, South Carolina in 2002. Since then, as Buttons or Gemini, he has brought smiles to numerous children and adults in South Carolina, Georgia, North Carolina and on Mission Trips. 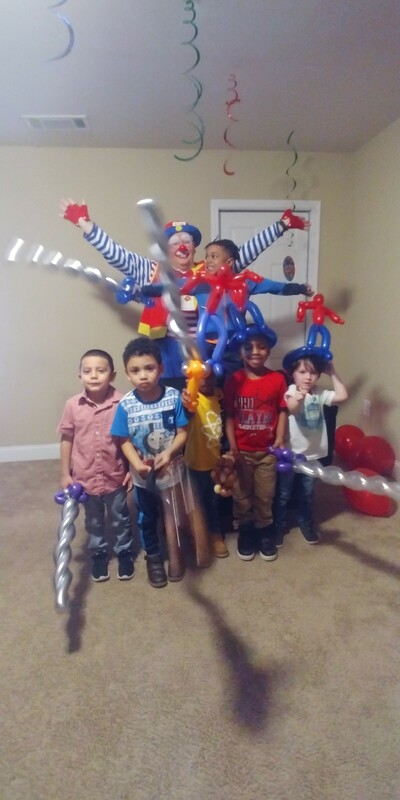 Wherever you find Buttons or Gemini twisting amazing balloon creations, mystifying with magic, or simply bringing laughter, people will have fun and be amazed with the magic and balloon art. Buttons or Gemini can bring a fun filled experience to a variety of venues! Complete the contact page or call Jim and schedule an appearance for your event! Look forward to hearing from you soon! If the performance is outside it must be a shaded area. Must have an inside area in case of rain. Need at least a 4 x 8 ft area for performance. one electrical outlet may be needed. Assistance with equipment is needed if stairs are involved. Buttons brings all equipment, electrical receptacle is needed for some shows.